Here's cheesecake deliciousness—in easy-to-make dessert-cup form. Get some pear slices and gingersnaps and we'll take you through it, step by step. Drain pear slices, reserving 1/4 cup of the juice. Crush cookies; sprinkle half of the crushed cookies evenly into 4 dessert cups. Stir together cream cheese spread and reserved pear juice in medium bowl. 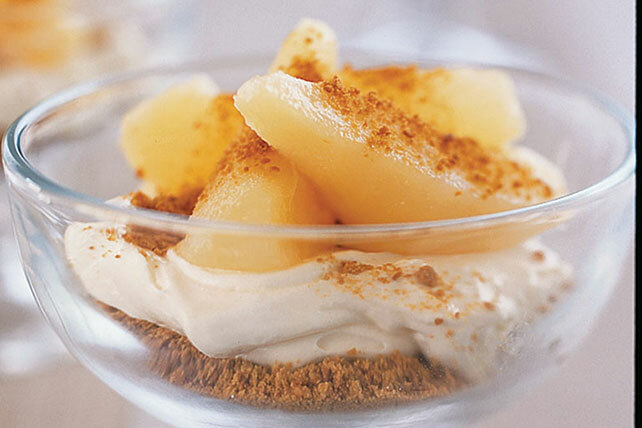 Stir in whipped topping; spoon evenly over crushed cookies in dessert cups. Top with pear slices and remaining crushed cookies. Prepare as directed, using PHILADELPHIA Neufchatel Cheese and COOL WHIP LITE Whipped Topping. Substitute peach slices for the pear slices.